The GSM-1500-DSA features a 1.2GHz 64-bit quad-core ARMv8 CPU with an 802.11n wireless LAN, bluetooth 4.1, 1GB RAM, 4 USB ports, full HDMI port. DGLUX5 is fully embedded. framework. Programming is browser based, drag and drop and easy to learn. 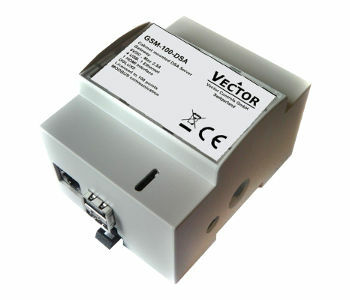 The Vector GSM-DSA is designed as a high power server for connection to Ethernet bus systems. The device is designed for control and regulation of building services. Via the integrated Ethernet bus system, the integration in modern buildings is used efficiently in central as well as in decentralized information focuses. Across the broad range of connectable Vector communicating devices, the scalable controllers can be extended at any time concerning the individual project requirements. About the free programmability a maximum of flexibility and comfort is guaranteed. As a result, the projects are ideally suited to the particular requirements both in the modernization of existing installations as well as for implementing current and future automation projects. DGLUX5 is a modern toolset to design real-time, data-driven applications and dashboards with drag and drop configuration. It runs on a browser and enables faster communication through real-time, data-driven dashboards for web, desktop and mobile devices. It is cost effective because, there is no special software or tool needed, no PC required on site and no certification classes necessary. Licensing is based solely on data being utilized in the interfaces built with DGLux5. This is achieved by keeping track of the number of topics a DGLux5 project employs when end users navigate through various pages and components. All DGLux5 licenses include unlimited user seats and projects on a single host device (embedded, personal or server). A topic is defined as a unique interaction with the server such as a subscription to a data point, an executed query, or a command like a set value. For example: a page with 3 gauges showing one unique value per gauge, a chart displaying two trends, and a graphic of a fan displaying and allowing control of fan status, would equate to 7 topics.